Well, let's be honest. The Cardinals are done. They're not coming back. No division crown, no wild card. Over, we are done. I was feeling down about it until I realized something. The Cubs are in first place! Most of you are probably saying 'Wait, I thought you were a Cardinals fan?' Yes, I am a Cards fan and yes, I hate the Cubs with a fiery passion. That's why I'm so happy they're in first. I don't have to watch as whatever team goes and wins a World Series. I still have something to hope for. That something is for the Cubs to choke. Under this scenario, the Cubs will go up against the Los Angeles Dodgers in the NLDS. I love the Dodgers' chances here. They have been on a role since acquiring Manny Ramirez, who will undoubtedly earn another hefty contract in the free agent market. Currently, they're my favorite to make it to the World Series from the National League. If the Cubs do slip past the Dodgers, then they would go up against either the Milwaukee Brewers or New York Mets. In a five game series, I think the Mets take it. 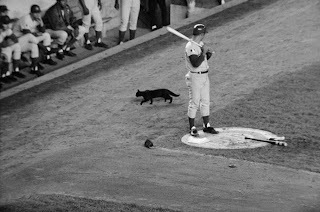 In the Cubs-Mets NLCS, the curse of Ron Santo takes place. There is no way the Cubs are getting past the Mets with Santo still part of the organization. In this scenerio, the Cubs once again face the Dodgers in the NLDS. My prediction stays the same as above. Once again, if the Cubs do slip past L.A., I think the Brewers take care of the Philadelphia Phillies in the NLDS, so that sets up an all National League Central NLCS. The Brewers fired manager Ned Yost. They're now the team that has no chance. In a series against the Cubs where no one gives them a shot, they prove that Billy Goats can cause curses. Ryan Howard vs. Rich Harden and Carlos Zambrano, as much as this intrigues me, I don't see the Phillies beating the Cubs. I see the Dodgers taking care of the Mets in that series, setting up Chicago to take a seat to Joe Torre ripping Yankee hearts out by making the World Series as Dodgers manager while the Yankees sit patiently at home waiting until CC Sabathia and Ben Sheets hit the open market. I really don't care how it works out. As long as the Cubbies choke, I'm going into the offseason a happy person. I love to see the Cubbies choke and all the sad faces on their drunk faces after it happens. The only thing that makes me happier is seeing St. Louis win.